It was a Friday evening. My husband had gotten home before me. I could hear him bumping around out on the back porch. Curious about what he was doing, I stepped to the door, and I could see him arranging things outside. Now, even more curious, I went out to where he was. I had to smile. Do you know what he was doing? My husband was out on the porch preparing for a “porch date”! I stood there admiring him for a few moments, thinking back on a multitude of memories – memories that wouldn’t really mean much to anyone else, but ones that meant so much to me. I reflected on how our “porch dates” began. What has become a tradition for us began in the earlier years of our marriage when, quite frankly, we had no money to go on a real date. Although both of us had college degrees, my husband had chosen to start a small construction and remodeling business, and together, we had made the decision that I would homeschool our son. These two decisions meant that both of us would leave well-paying jobs for the unknown! By faith, we did exactly that! The benefits for our family is a story of its own, but it was during this time, when we had so little money, that we learned how to plan simple (and cheap) family time and date time. “Porch dates” were an unexpected outgrowth of these lessons learned. “Porch dates” were simple. We would set aside time, just for us, to sit on the back porch, have a simple snack, and just talk with one another. That’s it! That’s all! Just uninterrupted time for one another. (We didn’t even answer the phone if it rang!) The best thing about the porch dates was how much each of us looked forward to that uninterrupted time! But that day, as I watched him prepare the porch, pulling up the chairs and ottomans, it became even more special. 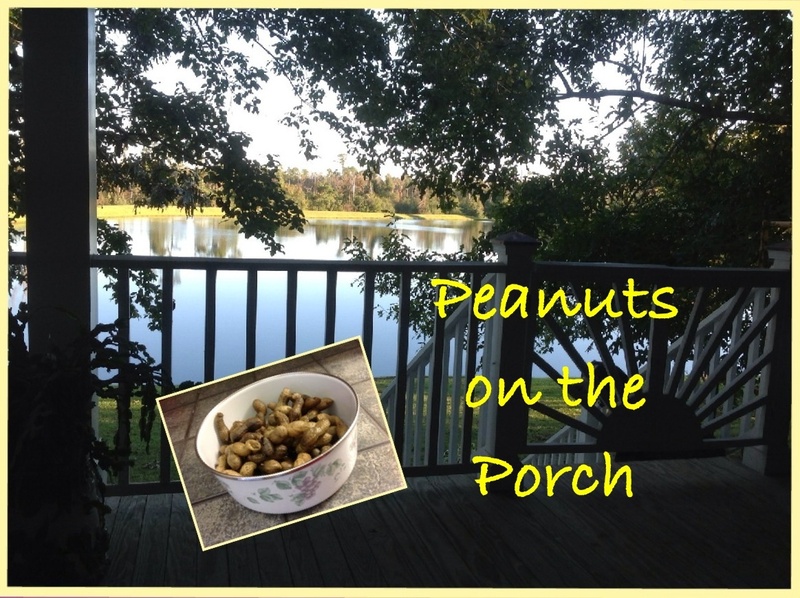 He had taken the time to prepare one of my favorite snacks – boiled peanuts! For those of you who may never have heard of boiled peanuts, they are prepared by boiling newly harvested peanuts while they are still “green”. This manner of serving peanuts, rather than roasting or parching, is a very “Southern” thing! You may wonder why boiled peanuts are so special to me. I gained a love for boiled peanuts as a child. I was raised in southeast Louisiana, and my grandparents farmed there. When they harvested the peanuts, they would boil them, and we thought they were delicious! My grandmother would also bag and freeze them for later. I loved to go to my grandmother’s, mostly because she had time for us. And a part of those memorable times included the boiled peanuts! Interestingly enough, on some of our recent camping trips when we were able to take our grandchildren along, what do you suppose we brought? You guessed it – boiled peanuts! I only hope that I can create as many loving memories for my grandchildren as my grandmother did for me. Why do I share these seemingly insignificant memories with you? I share them to encourage you to cherish family traditions and maybe to start a few of your own. I also encourage you to plan your own style of simple dates with your husband. Recall something that you both enjoyed together in the past, and do it again, and again, and again! It might just become your favorite tradition. You know, even though, now we can afford dinner out, sometimes we prefer just to have a “porch date”, instead! I’m thinking that this weekend I will plan our “porch date”. David loves to sit by the fire barrel. I think I will get chips and salsa, or maybe popcorn and lemonade, or I might get a little extravagant and make s’mores by the fire. Who knows? It might just turn out as special as peanuts on the porch!